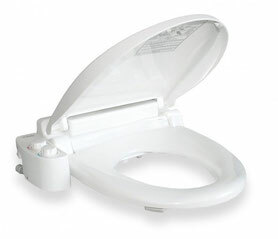 The Back Wash function features a solid stream of water to thoroughly clean the posterior. The Front Wash nozzle provides a softer, gentler cleaning that is more suited for feminine hygiene. The hydraulic lid and seat closes quietly, and gently, with a simple touch. Connects to your fresh water cistern supply using a T-Valve connection and hose (all neccessary fittings supplied). Simply turn the dial clockwise to start washing. Adjust the dial to your personal comfort by increasing or decreasing water pressure.